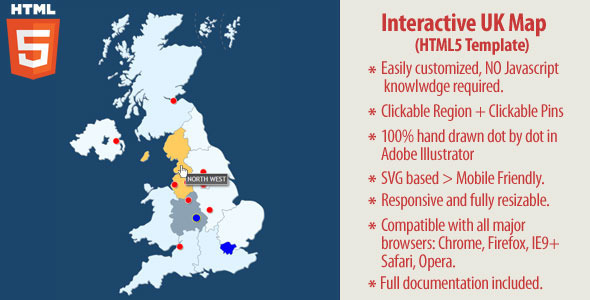 Interactive UK Map – HTML5 Created by Art101. This templates have specific characteristics, namely: Interactive has features such as High Resolution: Yes, Compatible Browsers: IE9, IE10, IE11, Firefox, Safari, Opera, Chrome, Software Version: HTML5 . You can use this Interactive UK Map – HTML5 on Html5 category for gmap, google maps, ipad, iphone, ireland map, london, mobile phones, no flash, resizable, rollover, uk map, united kingdom map, wordpress plugin, wp map and another uses. The map has 12 clickable UK regions and you can put unlimited number of clickable push pins anywhere on the map. The map can be used as interactive UK regional map or a blank map with clickable pins or both (regions and pins) as in the demo. Each region or pin can be linked to any webpage. Each region or pin can be activated/deactivated. Each pin can be customized individually (shape, position, colors, hover content, URL, etc). Easily integrated with WordPress using HTML Snippets plugin. The map is 100% hand drawn dot by dot in Adobe Illustrator for highest quality and best optimization. Note: We can customize the map for your own needs (private work). Full documentation is included. and an interactive X, Y coordinates guide is included (Similar to this).